Hippo on the Zambezi River near Victoria Falls, Zimbabwe. Photo taken by Kathryn Kingsbury on an Ujuzi Safari. I got home from my safari with Ujuzi and Dickerson Park Zoo a few days ago, but still have lots of memories to share. The Chobe River creates a unique ecosystem with an abundance of wildlife, and safaris via land vehicles or boat offer equally productive animal viewing. The park has a spectacular elephant population numbering in the thousands. Visitors have a very high chance of seeing entire herds of elephants at work and play. Chobe National Park is one of the few places one regularly sees hippos on land during the day. They do this because they’re competing with elephants for food. Getting out of the water during the day gives hippos more opportunities to graze and helps make sure the elephants don’t get all the grass. Because of the river, birdwatching here is good all day, not just in the early morning and late afternoon hours. The park is on the border between Botswana and Namibia, and is just an hour’s drive away from Victoria Falls, which itself is on the border of Zimbabwe and Zambia. You have your pick of countries to stay in when visiting Chobe. Our group started out the day with a drive from Victoria Falls to Chobe National Park. It didn’t take long to get through Botswana’s border control, and we were outside the park at 9 a.m. We spent the next few hours on a river safari, with our two guides pointing out a lot of remarkable wildlife we hadn’t seen yet on this trip, such as African fish eagles and black herons, or hadn’t seen up close, such as hippos and a baby crocodile. What surprised me most was how many land mammals we could view from the river. We saw Cape buffaloes, kudus, and a red lechwe. Most of all, we saw elephants—probably close to a hundred of them, and many up close as they played and drank on the shores of the river. Our group left Ngala Reserve yesterday, taking a short flight from Kruger National Park to Victoria Falls. We’re staying on the Zimbabwe side of the falls at the classic Victoria Falls Hotel, founded in 1904 as one of the first modern hotels in southern Africa. Hippos nap in Ngorongoro Conservation Area, Tanzania. Photo taken by Kathryn Kingsbury on an Ujuzi safari. 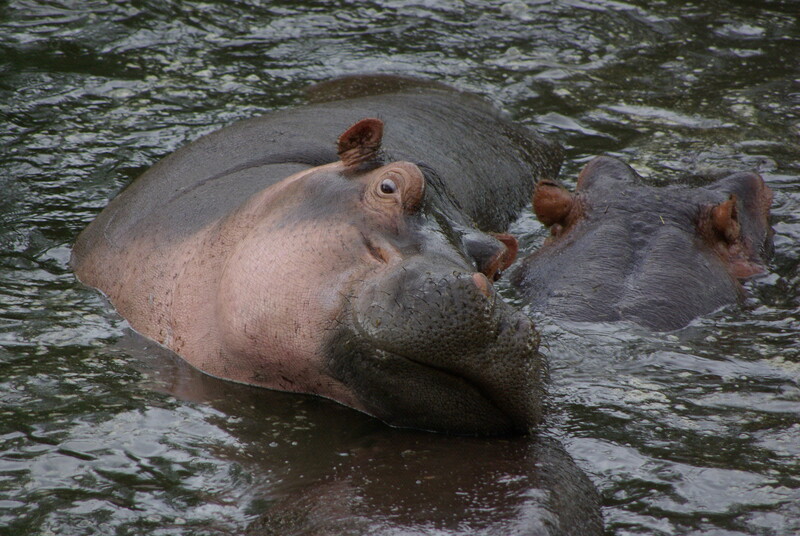 Hippos in Lake Mburo, Lake Mburo National Park, Uganda. Photo by Ralph Schenk of Mahingo Lodge, Uganda. Hippos rest on the banks of the Mara River in the Masai Mara. Photo taken by Kathy Overman on an Ujuzi Safari to Kenya. Would you like to see hippos in person? Join Ujuzi and Dickerson Park Zoo on a safari to South Africa in March 2016. Only 2 spots left! Endangered Species Day is this Friday, May 15. Sub-Saharan Africa is home to many endangered species that are beloved the world over. It is a privilege to be able to introduce people to this amazing creatures through Ujuzi Travel. I hope these safari photos of endangered animals inspire you to protect them for future generations! Ellen Wilson took this amazing photo of a young gorilla while traveling with Ujuzi in Rwanda. African elephant family. Photo taken by Petra Kilian-Gehring on an Ujuzi safari to Uganda. Beautiful crowned cranes spotted on an Ujuzi safari to Tanzania. A safari-goer in Tanzania caught some great footage of sparring hippos in the Serengeti. Imagine watching this in person! It’s amazing what you can see on safari, isn’t it? The shore of the Hippo Pool is a popular lunch spot in Ngorongoro Crater. Just don’t feed the hippos! Photo taken on a 2013 Ujuzi Safari in Tanzania. Hippos snuggle during a daytime nap. Photo taken by Mark and David Solberg on an Ujuzi safari.